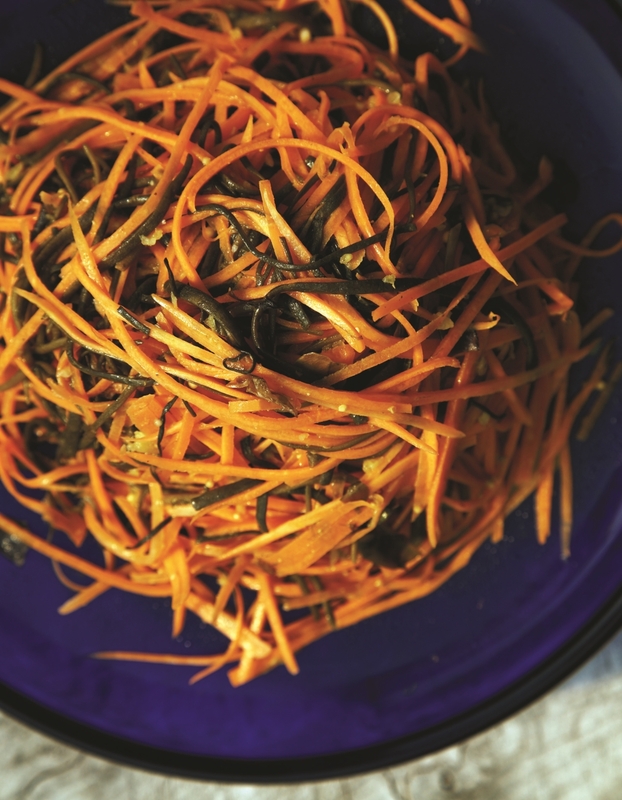 Willowy sea spaghetti and delicate carrot strips combine with a sweet garlicky dressing to create a salad as delightful to look at as it is to eat. Easy to prepare, this salad never fails to delight even first time seaweed tasters. 1. Rinse the dried sea spaghetti and soak in warm water for 1 hour or briefly steam until al dente. If using fresh sea spaghetti, rinse well and steam for 10 minutes until al dente. 2. Rinse the seaweed again and then marinate in lemon juice and wine vinegar for a few hours or overnight. 3. Some can be left full length to decorate – chop the remainder into 2.5 – 5cm (1 -2 inch) pieces. 1. Combine the dressing ingredients in a small jug or bowl. 2. Pour the dressing over the carrots and sea spaghetti and allow to marinate for at least an hour.